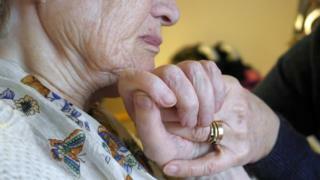 A £72,500 cap on social care costs due to come into effect in England will be scrapped, a health minister says. The proposed cap on an individual's care costs was developed following the recommendations of the Dilnot commission in 2011. But Jackie Doyle-Price told MPs the government would not be "taking forward the previous government's plans to implement a cap on care costs in 2020". Labour's Barbara Keeley accused the government of wasting time and money. In a statement to the Commons, Ms Doyle-Price said there would be a process of "initial engagement over the coming months" to shape the long-term reforms which will be set out in a green paper next year. The cap recommended by the Dilnot commission was put into an Act of Parliament, but the government unveiled a radically different proposal during the election campaign, which was widely blamed for Theresa May failing to win a majority in the snap election. They have since announced a fresh consultation on the future system of social care for older people, due to be published next summer. Ms Doyle-Price said: "The prime minister has been clear that the consultation will include proposals to place a limit on the care costs individuals face. "To allow for fuller engagement and development of the approach with reforms to the care system and the way it is paid for considered in the round, we will not be taking forward the previous government's plans to implement a cap on care costs in 2020." But shadow health minister Ms Keeley countered: "The minister has today finally confirmed what many of us on these benches suspected - that they will not be proceeding with their plans to cap care costs by 2020 as legislated by this House. "This is a shameful waste of taxpayers' money. Over £1m in today's money was spent in commissioning the Dilnot review and it is a waste of Parliamentary time enacting that cap. "And it's no good for the minister to say that the government are consulting on this cap: they consulted on this during the general election and their proposals were rejected by the electorate." Former Conservative minister Sir Desmond Swayne said: "In the absence of provision that I might make, and indeed Dilnot might have encouraged me to make, is it reasonable for me to expect for my social care costs to be paid for by the state, and yet my heirs to inherit my substantial housing assets?" Ms Doyle-Price said in reply: "I think he, in a nutshell, actually summarises neatly one of the debates that we have to have in this space, which is about how we ensure that people can achieve care when they need it and that it will be paid for, whilst at the same time achieving inter-generational fairness." Izzi Seccombe, who chairs the Local Government Association's Community Wellbeing Board, said adult social care faced an annual funding gap of about £2.3bn by 2020. She urged the government "to put this right and inject genuinely new money into social care without delay". "It was hugely disappointing that the chancellor found money for the NHS, but nothing for adult social care in the autumn Budget," she said. "Difficult, brave and possibly even controversial decision-making will be required to secure the long-term future of care and support, not just of older people but adults of all ages such as those with learning disabilities, and provide support for carers," she added.